Paul Gilbert is back! Okay, so that makes it sound like he’s been gone, which isn’t fair in the slightest. He’s certainly been getting around the last few years – releasing solo material; new music with Mr. Big; as well as hosting his highly acclaimed Rock Guitar school at ArtistWorks. Yet, despite all this, he’s been severely absent in writing a lyric-based, Gilbert-fronted album as of late. His recent solo endeavors have been either instrumental, half-lyrical and half instrumental, half covers, or Paul has taken a back seat on the microphone – as was the case of the truly stellar album, United States, featuring Freddie Nelson. In fact, not since 2005’s Space Ship One have we gotten a truly 100 percent Paul Gilbert release. And, my friends, there’s nothing quite like it! Gilbert’s new album, I Can Destroy, was released in Japan December 2015 and will grace the U.S. on Friday, May 27. Now, before I get started, let me tell you that I’ve been a fan of Paul’s music for over 10 years. He has been one of my absolute favorites, whether going into a frenzy with Racer X, tinting our minds in Mr. Big, or burning organs in his solo career. He has this delightful talent of bringing us not only music infused with technicality, but with soul and laughter to boot. It is with this mindset that I dove into this new release. The key component to any Paul Gilbert album is, in my opinion, that it’s fun! Paul has a wonderfully diverse sense of humor, evidenced in the past by songs such as “Boku No Atama” and “I Am Satan;” the former a nonsensical tune sung in Japanese and the latter a tale of finding love in the most unexpected of places. That same humor is presented immediately to the listener here in “Everybody Use Your Goddamn Turn Signal,” a track that I imagine will surely find a welcome home in commuter traffic in the near future. Then there’s the tongue-in-cheek “I’m Not The One (Who Wants To Be With You),” which takes a stab at Gilbert’s Mr. Big hit, “To Be With You.” And while neither last, nor least, there is “Blues Just Saving My Life,” in which seemingly everyone, past and present, is attempting to kill our dear hero. And it is surely suitable that Blues are the saving grace here, as this album is quite heavily invested in that sound. I just want to touch on a few of my stand-out tracks. Firstly, two members of Gilbert’s band at present are the previously mentioned Freddie Nelson, as well as another vocalist and guitar player, Tony Spinner. Both of these men lend their wonderful vocal chords to quite a few tracks, such as “Knocking On A Locked Door,” complementing Gilbert’s own singing and keeping the album fresh to the ears. Then there’s “I Will Be Remembered,” which I feel should include a parenthetical (The Villian’s Song), telling the tale of a man who loves and leaves tears in his wake. But truly topping my favorites off this album is the title track, “I Can Destroy,” a throwback if I’ve ever heard one to Gilbert’s days in Racer X, with a bombastic drum intro, duel guitar motif’s, and fret-burning solos. When he says, “…and this guitar is built to play,” he isn’t kidding in the least! So coming back once more to that key component: is the album fun? Spoiler alert, the answer is yes! While not boiling over with upbeat tunes, and even slowing down on occasion with poignant tracks like “Love We Had,” there is still an overwhelmingly joyous feeling that flows from the songs on this album. And while this release isn’t as over the top as some of Paul’s previous releases in terms of goofiness, there’s a consistent smirking quality that is apparent on many of the tracks presented here. So don’t expect to find another Alligator Farm or Burning Organ; he’s been there, done that. What you can expect, however, is a great collection of songs featuring some wicked musicianship and lots of guitar action. 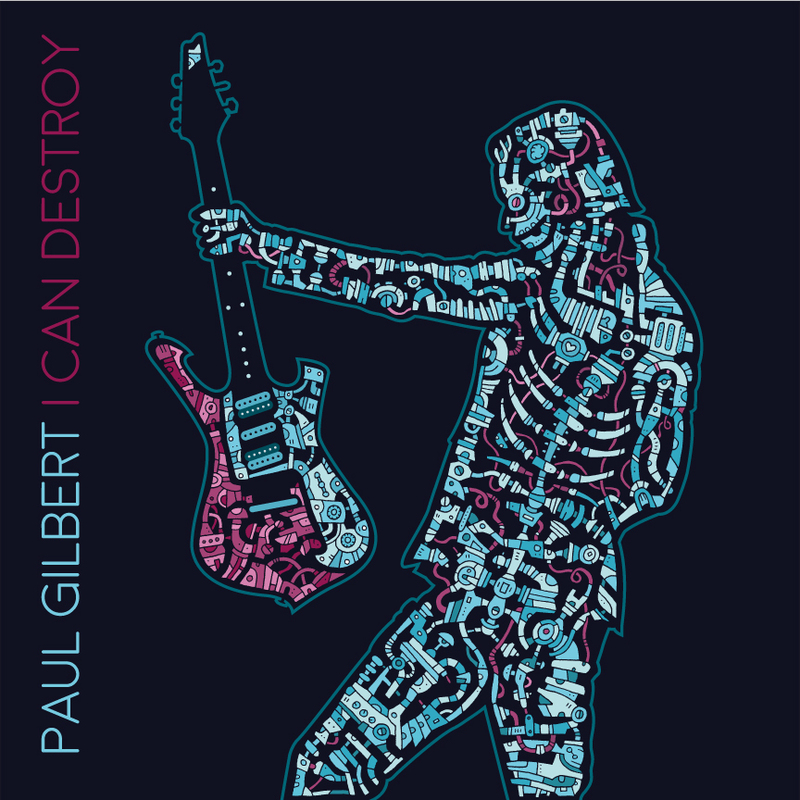 I Can Destroy is honestly my favorite Paul Gilbert release in some time. Go grab a copy, but make sure to use your turn signal.